Kenny Drew has an immaculate pedigree as a jazz pianist working with many major names including Sonny Rollins on “Tour-de-Force” and with John Coltrane on the iconic “Blue Train” to name just two. In 1961 he travelled to Paris and found work but in 1964 he settled in Copenhagen and found enough work with local musicians and visitors from the States. He formed a Duo with Danish bassist Niels Henning Orsted Pederson and recorded prolifically. He worked for many years at the Club Montmartre Jazzhuis and recorded a number of live albums from the club with Dexter Gordon and also Ben Webster. He recorded four Songbook albums two of which appear on this album plus one dedicated to Harold Arlen and a second one featuring Harry Warren compositions. 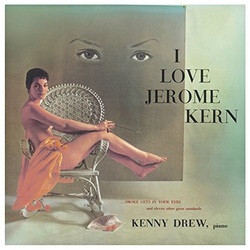 Of the two albums on this release the first recorded in 1957 was called “I Love Jerome Kern” and appears to be aimed at wider audience than a purely jazz one. All the tune are played well enough but there is little improvisation which a number of prominent pianists were doing at the time and they probably had a limited success. The second album which was recorded earlier in 1953 and called “Jazz Impression of Pal Joey” is a different proposition with Kenny Drew playing in a much more attacking style and swinging hard propelled by Art Blakey’s drums. All the tunes from “Pal Joey” are included all the well known ones like “My Funny Valentine” and “The Lady is a Tramp” plus some not often heard such as “Happy Hunting Horn” and “What is a Man” but they are all given the appropriate treatment. It is a differing release but the Rodgers and Hart track are well worth a listen it depends whether you are an admirer of Kenny Drew’s piano style.